Masters 2015: Who might deny Rory McIlroy the Green Jacket? If Rory McIlroy is to be denied a career Grand Slam at the Masters it may be because of the quality of the opposition rather than his problems with the course. McIlroy's best finish at Augusta came last year when he was eighth behind Bubba Watson. The world number one has yet to find his best form on a layout that theoretically should set up well for his playing style. And for the 25-year-old to land his first Masters title he will surely need his very best form because the list of potential winners is long and impressive. The threats come from across the age spectrum, with so many of the world's best players heading into the year's first major with form and history on their side. 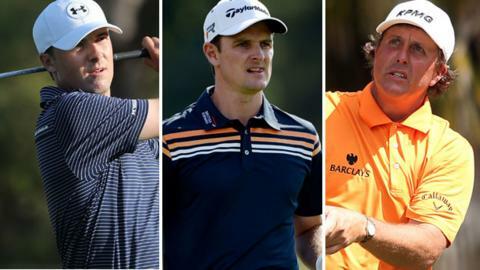 Here are some of the players other than McIlroy to watch out for this week. In his last three outings the 21-year-old Texan has two runner-up finishes and a victory in the Valspar Championship. An exemplary ball striker and fearless putter, Spieth made a stunning Masters debut 12 months ago when he was runner-up to Bubba Watson. Perhaps his only worry is burn out following his play-off defeat to JB Holmes in Houston on Sunday. But he has bags of youthful energy, adrenalin and secure putting nerve to counter fatigue. Still only 24, Reed is a four-time winner on the US PGA Tour and has risen to number 15 in the world rankings. He won the Tournament of Champions at the start of the year and finished the Florida swing with a runner-up finish to Spieth. A former student at Augusta State he made a miserable Masters debut last year when he missed the cut. But after a stellar Ryder Cup debut, Reed exudes a cocky confidence and game that make him a genuine Masters threat. The 26-year old's fifth place at Augusta last year was followed by three runner-up finishes in the remaining majors, suggesting Fowler reserves his best golf for the biggest events. This year has been disappointing with 12th at the WGC event at Doral in March his best showing. The fact he has only won once on the US PGA Tour, back in 2012, also counts against the popular American. Regarded as possessing one of the best techniques in the game, the 23-year-old Japanese star seems ready for a major breakthrough. He missed the cut at Augusta last year but in 2013 finished in a share of sixth at the Open. He has climbed into the world's top 20 after winning the Dunlop Phoenix event in Japan at the end of last year. He has followed that victory with a share of fourth in San Diego and second in Phoenix. The winner in two of the last three years, Watson appears better equipped to make a successful title defence this time around. The instinctive left-hander was distracted by the attention generated by his first triumph in 2012 and a year later he was fortunate to make the cut. The 36-year old has finished in the top three in two of his last three events, but has not competed since finishing third at Doral last month. In the week of his 39th birthday, the Swede is bidding to become Scandinavia's first winner of a men's major. In his last three tournaments, Stenson has finished second, fourth and fourth on the US PGA Tour. He missed last week in Houston with flu but heads to Augusta with four top-four finishes in majors over the past two years. His 2014 showing at the Masters, where he was 14th, was his best result to date. When the 36-year-old won the recent Texas Open, he completed his fifth US PGA Tour victory in 18 months. A late bloomer, Walker made his Masters debut last year and finished in a creditable share of eighth place. It was one of three top-10s in the 2014 majors. Walker's outstanding touch on the greens and current winning habit make him a genuine Augusta contender. Few players can live with McIlroy's length off the tee but 30-year-old Dustin Johnson is more than a match for the Northern Irishman. Having returned from a six-month leave of absence when he confronted personal challenges, Johnson appears a more mature figure. He is reaping the rewards and completed a hugely-impressive win at the WGC Championship at Doral last month. He certainly possesses the power required at Augusta, whether he has the touch and finesse to don a Green Jacket is another question. This is the Englishman's 10th crack at the Masters and at first glance his chances don't look too encouraging. He suffered a miserable spell through the Florida swing and has missed three cuts in his last five events. But he has recovered from a troublesome wrist injury and there were flickers of form in Houston last week. He was fifth in the 2007 Masters and eighth in 2012. Having won the US Open a year later, Rose, 34, knows what it takes to win a major and may enjoy coming into this one a little under the radar. There's been little to excite Phil fans since his Open victory in 2013 when he collected his fifth major title. But it's impossible to ignore the 44-year old's Masters record, which includes three Green Jackets and seven more top-five finishes. His previously dodgy putting stroke looked much more secure in Houston last week after spending painstaking hours working on the practice greens. Mickelson often comes alive once he drives down Magnolia Lane. Having suffered the pain of ineligibility last year, the three-time major champion is back courtesy of his recent win at the Honda Classic. Harrington, 43, says he is coming back with the enthusiasm of a rookie but boosted by plenty of past experience. Twice he has finished fifth at the Masters and an inspired week on the greens might just make him an unlikely challenger. McIlroy v the Masters: Is history on his side? Read more on McIlroy v the Masters: Is history on his side?